The first time I saw it, I knew I was home. Don’t ask me how I knew … I just knew. I felt it the moment I saw it in the realtor’s big binder of available houses. I felt it the moment I pulled my car into the driveway. I felt it the instant I walked through the front door to take a look around. And by the time I had peered into every closet and looked inside each cabinet, I knew this house was home. As a single mom, I never set out to buy a home. I certainly didn’t feel financially ready for such a big purchase. Yet my hands were tied. 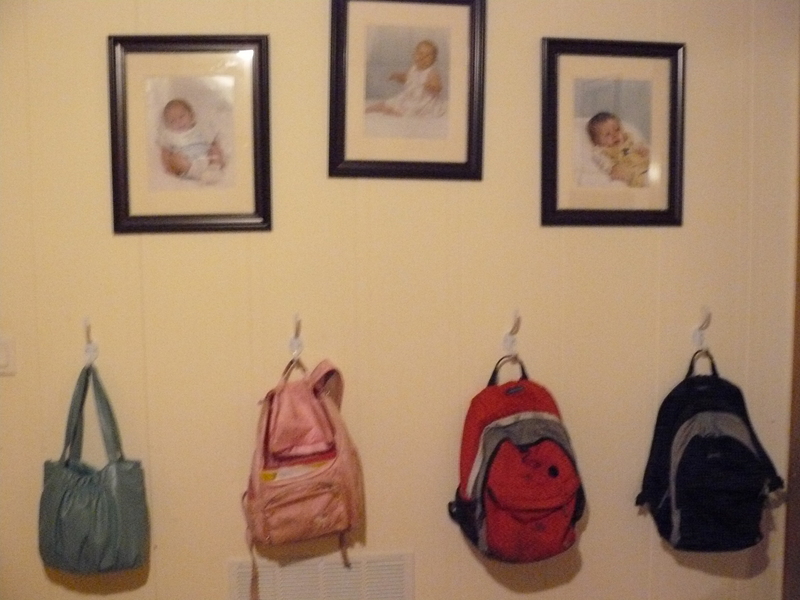 If I didn’t do something quickly, my three children and I were going to be homeless. 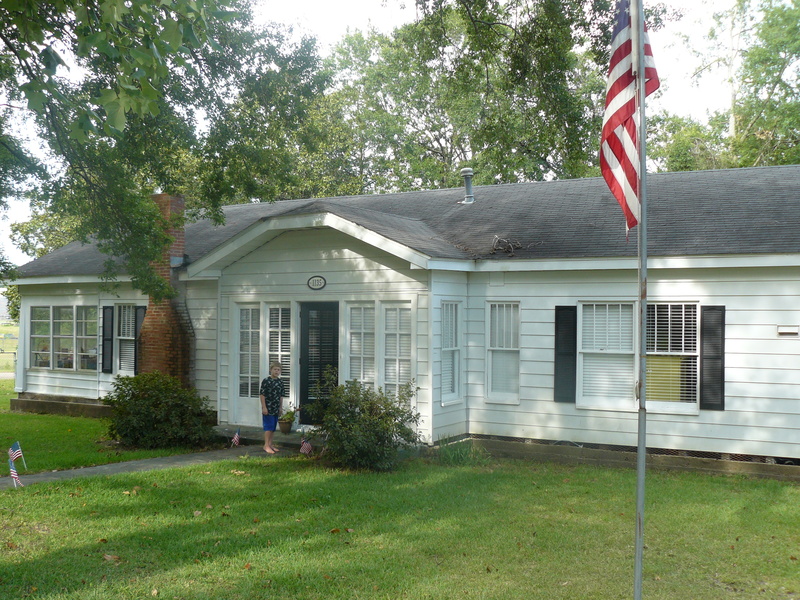 The home that I had been renting from my parents had been sold, and I needed a new place to live before June 1st. Initially, I hoped to find another rental home, but the rural area where I was living had nothing to offer. I had been checking every listing every day for close to two months, as well as calling anyone I could think of who might have a lead on a home for rent. Nothing. It was now early April. Time was running out. I needed to make a move … soon. But I had no idea of where to look. I was fresh out of ideas. The only option that seemed to be available was moving to a larger city, away from my job and the security of living near my parents. And I desperately didn’t want to do that. And then my brother suggested buying a house. The very thought scared me, but with his encouragement I cautiously went to see his realtor. The realtor was friendly and warm, and took the time to share with me how even with my one-income budget I could afford to be a home owner. Carefully, I chose three houses to go look at with the realtor … but there never was any other choice. One look at the photo of the little white house in her binder and I was in love. 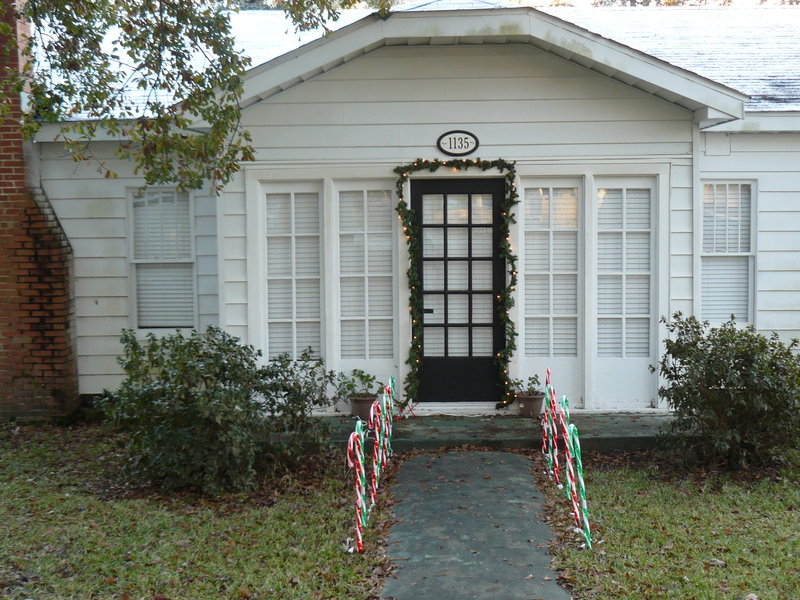 Built in the early 1930’s, this home was full of character and charm, and I instantly felt at home from the very first moment I put my foot inside the door. The floors were hardwood. The ceilings were 10 feet tall, with original transoms over the doorways. The kitchen was outfitted with a Butler’s pantry. All over the house were pocket doors. In addition to the three large bedrooms, there was an office that had floor-to-ceiling bookshelves and a glassed-in sun porch. I knew I wanted to buy the house, but I was nervous about making the final decision to go through with it. “Take your time. Think about it; pray about it. 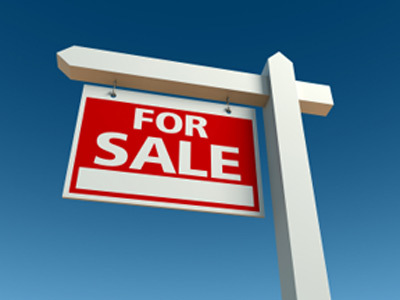 And when you are ready, give me a call.” The realtor gave me a warm smile as she shook my hand and we parted ways. Part of me had hoped they would tell me what to do. Part of me was glad they didn’t. Even though decision-making has never been my strong suit (just choosing a restaurant can at times be a difficult task for me), this decision was still mine to make. And even I knew that I needed to make the final decision for myself. Six weeks later, I was unpacking boxes. My kids and I only lived there for a year and a half … but we did a lot of living in that time. 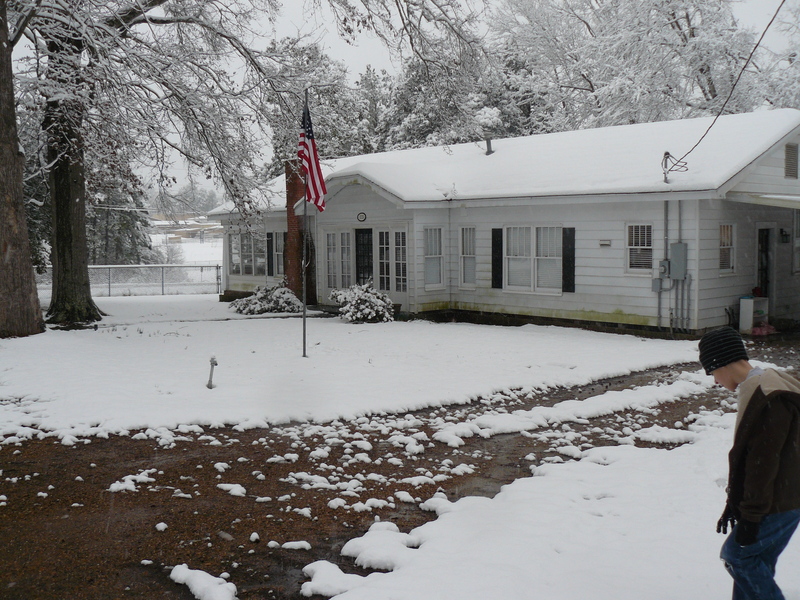 There were six birthday parties and two Christmases and a couple of rare Louisiana “sneaux” days. 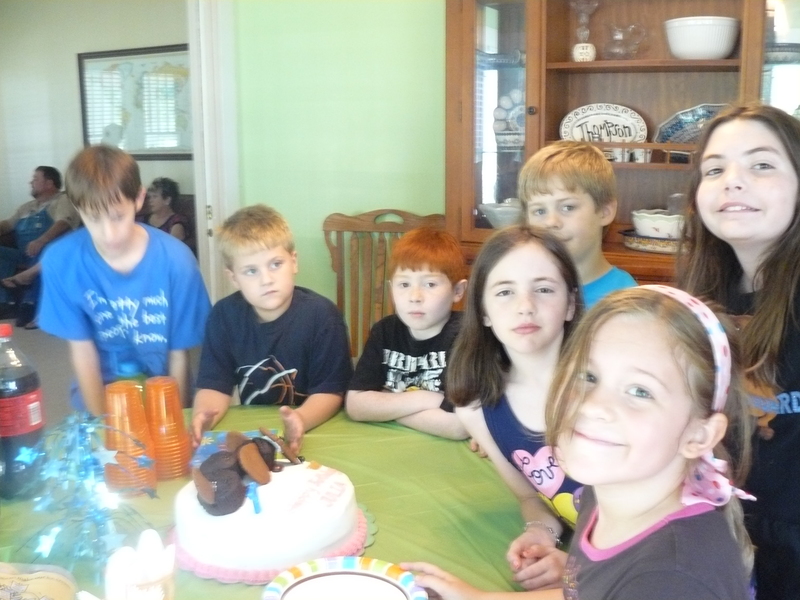 Julia turns 7 years old! I bought a drill of my own, and learned to hang my own curtains. Always before, someone had hung curtains for me, but in this home I proudly hung the curtains for myself. 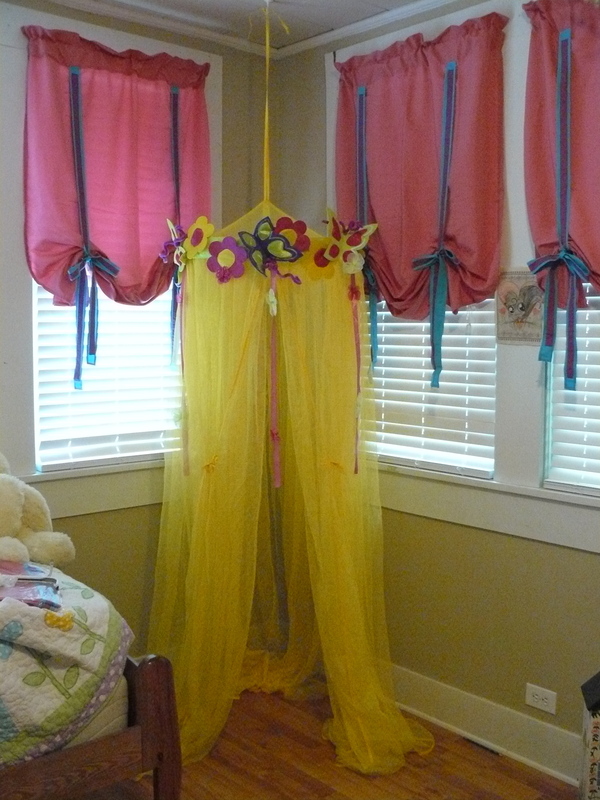 Julia’s girly butterfly room with the bright yellow hideaway in the corner. I hung that in addition to the pink curtains … there were 8 windows in her bedroom! The backpack nook … about as organized as I ever got! 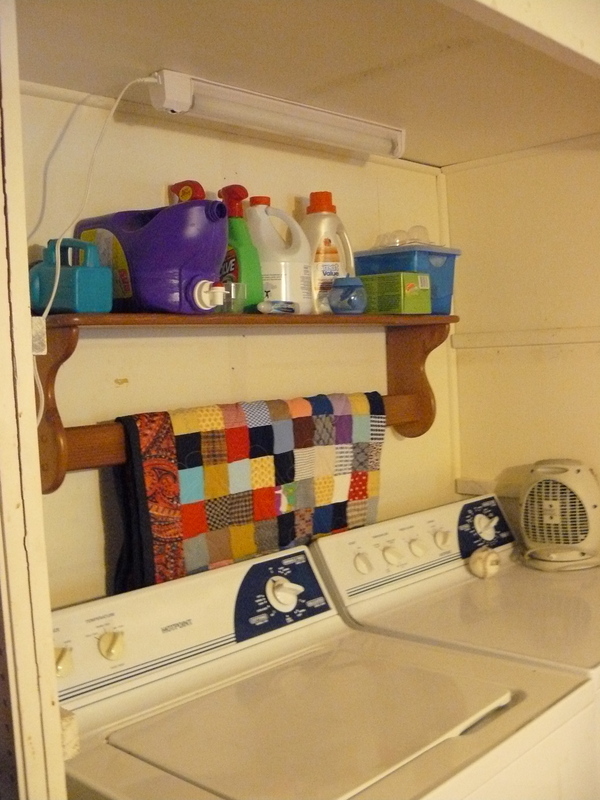 and added a shelf above my washer and dryer. My little laundry area. Of all the places I’ve ever washed clothes, this one was my favorite. And then there are my two special memories from my little white house on the big corner lot. 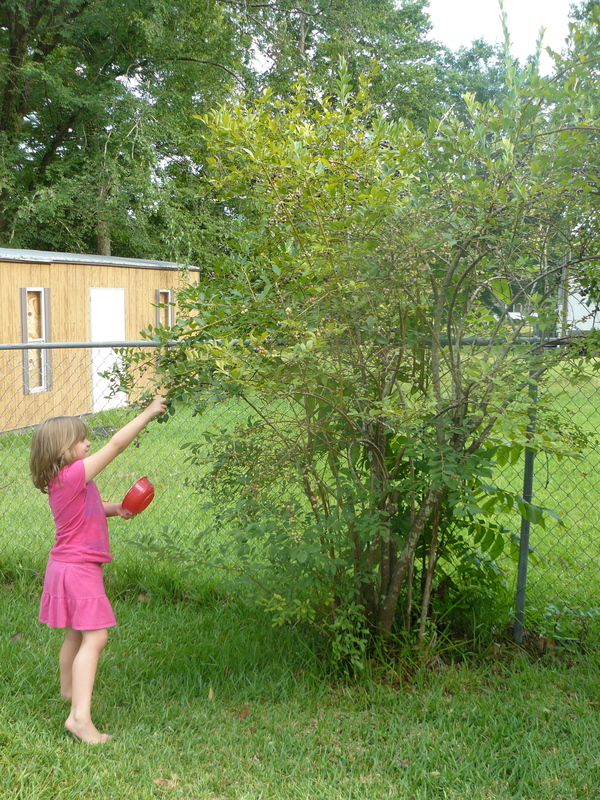 Julia fills a bowl with blueberries from one our special blueberry bushes. I married Jon on the last day of 2010. Two weeks later a moving truck took all my belongings out of my little white home, and a renter took my place. For four years, I’ve been renting my house. Mostly I’ve hated being a landlord, and that’s not at all because of the renters. Mostly God has granted me good ones. No, I hate renting out my house because I’m ultimately still the one responsible for the property. My dad used to help us with the management of my house, serving as my property manager if you will. But after his death 3 months ago, Jon and I have had to take all of those tasks. And it quickly became clear to us that the house was like a millstone hanging around our necks. Instead of a pleasure to me, my sweet little house on the big corner lot has become a burden. It simply too much of a struggle for Jon and I to manage the upkeep of that property. We discussed whether or not we should put the house on the market, but I didn’t want to run off my renter and end up trying to cover two mortgages. It was hard to know what to do, and honestly I felt stuck between a rock and a hard place. And I’m wondering if it is time for me to move on as well and let go of the house I love. As much as I knew the first time I saw it that this house was meant to be my home, deep down I know that I’ll never live there again. I’m ready … ready for whatever God wants, whether it is bringing me a buyer or finding me another renter. He knows and I can trust He has this under control. But just in case you wonder which way I’m hoping God choosing to work in this situation, there is a nice white house on a big corner lot for sale in rural north Louisiana. If you’re interested, I’ll be happy to make you a great deal! Love reading your blogs Paige!! I pray that God’s will be done with the house! How much are you asking for it? Tell me, again, exactly where it is?! You know, my friend, you have experience in realty … maybe you could help me stage it! Actually, I think it will just be empty for the most part. But it would be fun if we could do something like that together. What a beautiful little house! We’ve only owned one home since getting married, and the thought of parting with it chokes me up a little bit… I’ll be praying that you find just the right buyer for your house!